JQuery Cycle is a wonderful plugin to add slideshow to your website easily. It supports slide effects (fading, cross, sliding etc..) and call back functions. 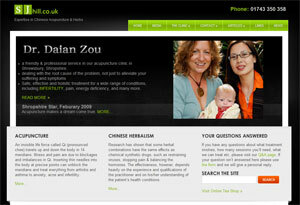 New website for Shropshire’s leading acupuncturist Dr. Daian Zou is now launched. Dr. Daian Zou is an esteemed acupuncturist running a clinic at St. John’s Hill in Shrewsbury, Shropshire. The website features animation slide show on home page; Wordpress content management system with testimonials, articles, and news. For many people who know what they do, they can have a self-made website by using Wordpress and the widely available themes on the Internet. 2. In the admin, click the “Appearance” menu item, under the “Install Themes” tab, click “upload", then upload the theme file you downloaded from the Internet. The theme file is a zip file containing various files. After the theme is installed, you need to activate the theme and you are ready to go.